A none too vintage June drew to an uneventful close, with nothing much more than singles of Curlew and Greenshank over the Bill, the same or another Greenshank over Blacknor and 25 Mediterranean Gulls at Ferrybridge. Despite it being the chilliest, dewiest night for a while interest picked up a little in the Obs garden moth-traps, with singles of Spindle Knot-horn Nephopterix angustella, Double-lobed and Marbled White-spot all noteworthy wanderers; 5 Rusty-dot Pearl, 3 Diamond-back Moth and 2 Silver Y were the only conventional immigrants caught. 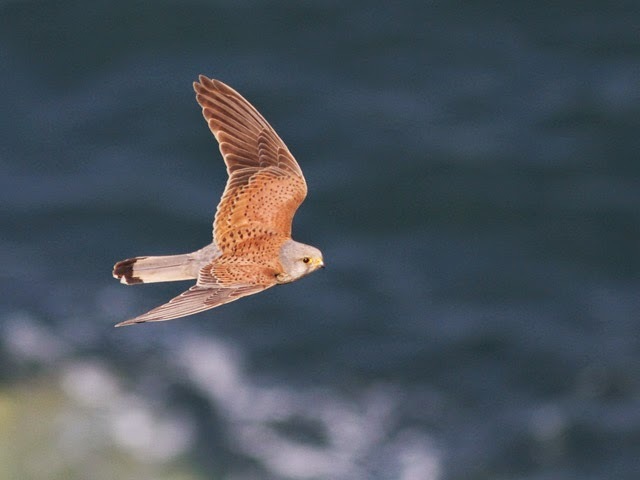 Just about all the news was from the seawatchers, with 130 Manx Shearwaters, 20 Common Scoter, 4 Balearic Shearwaters, 4 commic terns, 3 Black-headed Gulls, 2 Mediterranean Gulls and 2 Sandwich Terns through off the Bill. The only other reports were of the Hooded Crow still about at Admiralty Quarry/Grove pig farm and a Chiffchaff at the Bill. Immigrants/wanderers caught overnight in the Obs garden moth-traps included 8 Rusty-dot Pearl, 2 each of Diamond-back Moth, Cream-bordered Green Pea and Silver Y, and singles of Clouded Border and Dark Spectacle. With the exception of the Hooded Crow that lingered on in and around the Grove pig farm all the day's reports came from the sea, with 54 Manx Shearwaters, 25 Common Scoter, 3 Balearic Shearwaters, a Canada Goose and a Mediterranean Gull through off the Bill. A particularly paltry selection of immigrant moths at the Obs consisted of just 4 Diamond-back Moth and 2 Dark Spectacle. 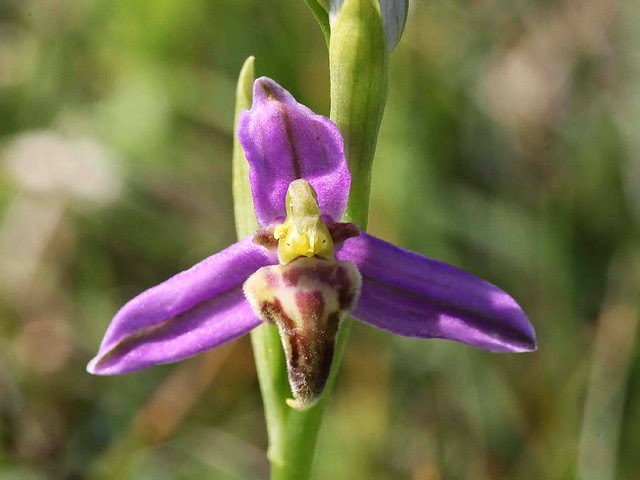 A reminder that the next In Focus field event at the Obs takes place between 10am and 4pm tomorrow, Sunday 29th June. Contrasting fortunes on the weather front today with a dreary, quiet morning with occasional spits and spots of rain giving way to a sunny and increasingly breezy afternoon. The quality of the birding didn't change at all: the Hooded Crow was again in and around the Grove pig farm, a new Blackcap showed up at the Obs and a few Manx Shearwaters were milling around off the Bill. 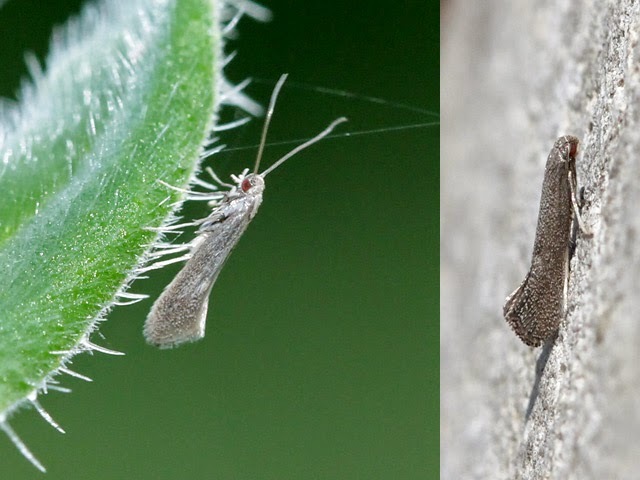 With the exception of a single Bulrush Cosmet Limnaenia phragmitella at the Obs, overnight mothing was uniformly poor: in comparison with the last fortnight numbers and variety were very subdued, with 10 Rusty-dot Pearl and singles of Diamond-back Moth, Dark Sword Grass and Silver Y the only immigrants caught in the Obs traps. 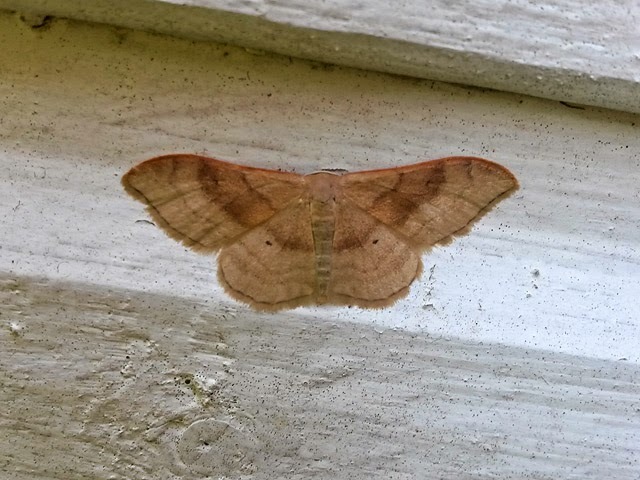 ...we could really do with knuckling down to getting the Portland moth records together in one place: our base-line survey of the all-time records is getting on for 20 years out of date and everything since is still tucked away in notebooks or lost on ancient spreadsheets on nearly defunct hard drives. 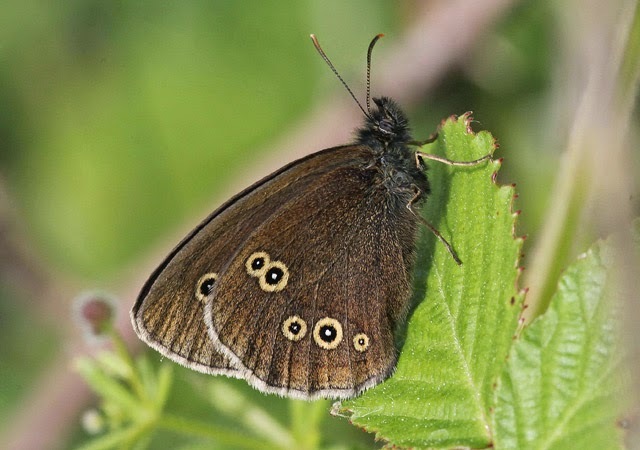 For this reason it's often difficult/impossible for us to be sure how many records there have been of occasional wanderers like this that aren't enumerated in full in the Obs annual report. The long-established anticyclone that's brought us more than a fortnight of really nice summery weather finally begun to lose its influence today, with the passage of a fairly weak weather front introducing a spell of patchy rain early the afternoon. The change did little for the quality of the birding: the Hooded Crow was again at the Grove, 14 Mediterranean Gulls and 3 Dunlin were at Ferrybridge and 50 Manx Shearwaters, 4 Common Scoter and a Black-headed Gull passed through off the Bill. 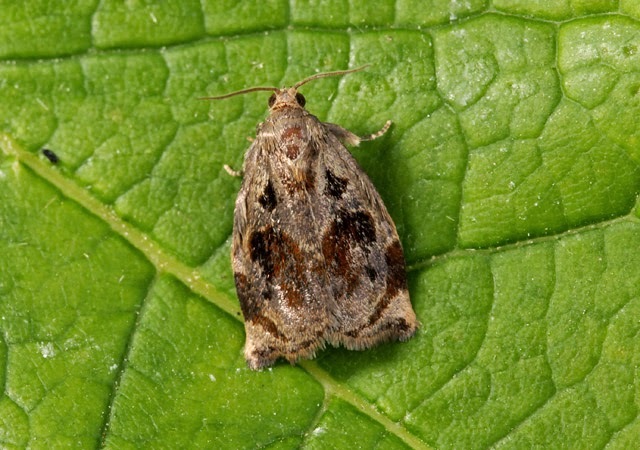 The main moth news of the day concerned another addition to the island list: a Brown Oak Tortrix Archips crataegana was caught yesterday at Reap Lane. 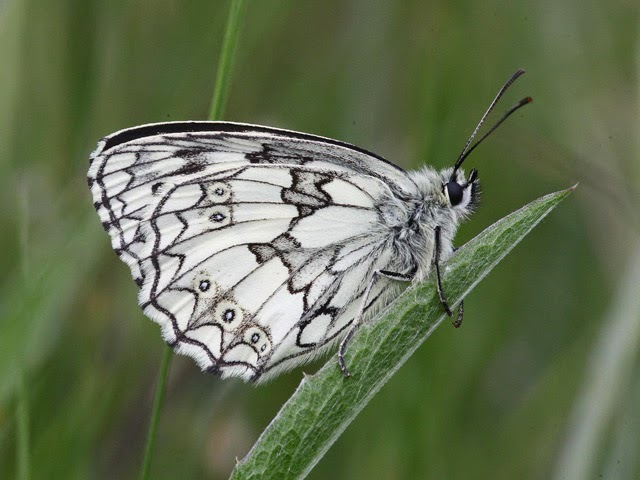 Immigrants hardly featured today, with 2 Rusty-dot Pearl and 2 Silver Y the only species making the tally at the Obs; singles of Scallop Shell, Round-winged Muslin and Green Silver-lines were all noteworthy wanderers there. Another very pleasant day although beginning to feel a little fresher in a sometimes brisk easterly. The only reports of any consequence were of a Grey Heron over Easton and a Common Scoter through off the Bill. 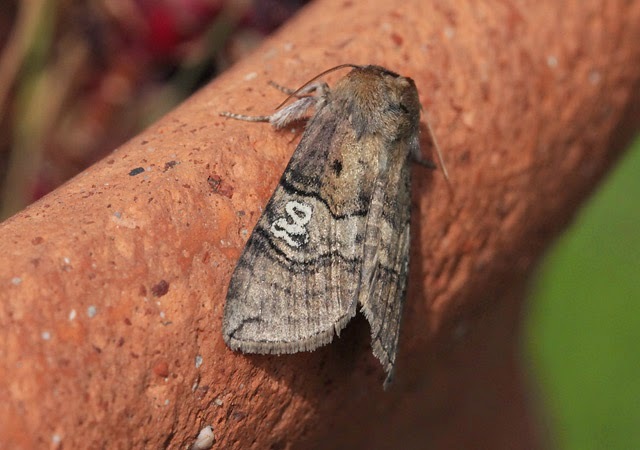 Moth interest remained at the ticking-over level, with the immigrant/wanderer tally from the Obs traps consisting of 11 Rusty-dot Pearl, 7 Silver Y, 2 Diamond-back Moth and singles of Tawny-barred Angle, Figure of 80 and Delicate; a Dark Pine Knot-horn Dioryctria abietella at the Grove was the best of the bunch elsewhere. With nothing of note bar the Hooded Crow (which was reported from the Bill early in the morning) on the land it was left to a few odds and ends on the sea off the Bill to provide the bulk of the day's sightings; these included 49 Common Scoter, 40 Manx Shearwaters, 6 commic terns, 3 Mediterranean Gulls and 2 Sandwich Terns. 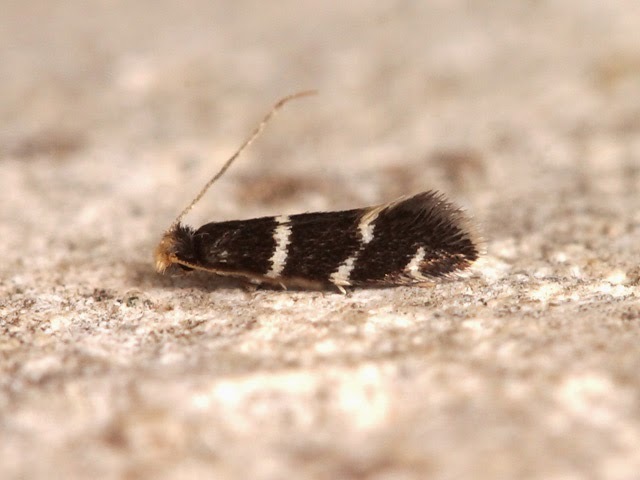 Immigrants/wanderers in the Obs garden moth-traps included 17 Rusty-dot Pearl, 5 Diamond-back Moth, 2 each of Dark Sword Grass, Cream-bordered Green Pea and Dark Spectacle and singles of Blotched Marble Endothenia quadrimaculana, Delicate and Miller. 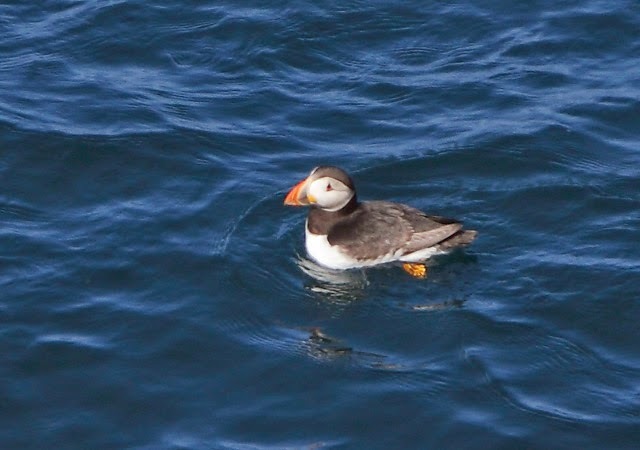 ...we don't often bother to mention the Puffins once they've settled in but they are still about, with the highest count so far this summer being just 4. 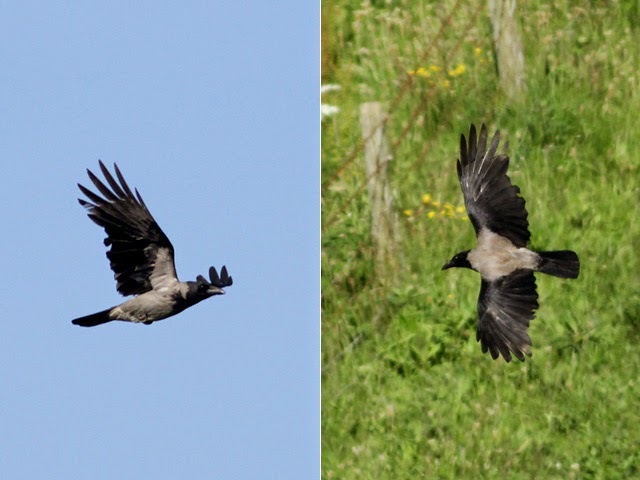 The Hooded Crow showed up again early in the morning at the Bill, from where it flew so far out to sea that it was lost to view for a while before about-turning and eventually heading back north over the Obs. New arrivals at the Bill included 3 Grey Herons, a Sand Martin, a Willow Warbler and at least 1 Chiffchaff, whilst another 10 Sand Martins passed through at Ferrybridge. Seawatching at the Bill came up with just 18 Common Scoter and 3 Black-headed Gulls. A disappointingly poor showing of immigrant/wandering moths at the Obs included 18 Rusty-dot Pearl, 3 Diamond-back Moth, a Cream-bordered Green Pea and a Silver Y. 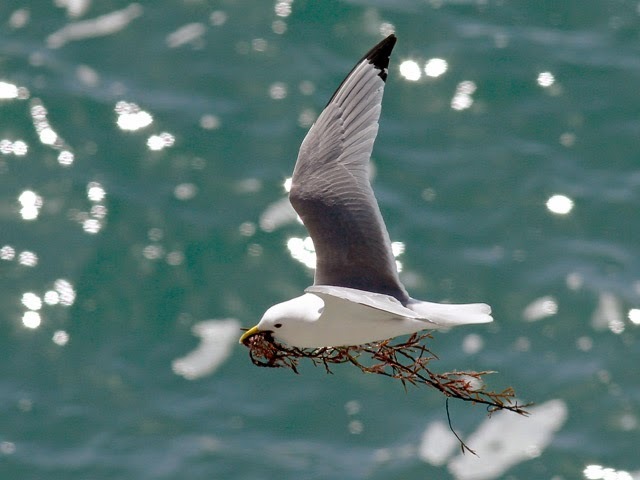 We will get round to some photos shortly but right now there are just too many Storm Petrels, moths, football matches, articles to write etc going on and far too few hours in the day to fit them all in - sorry! 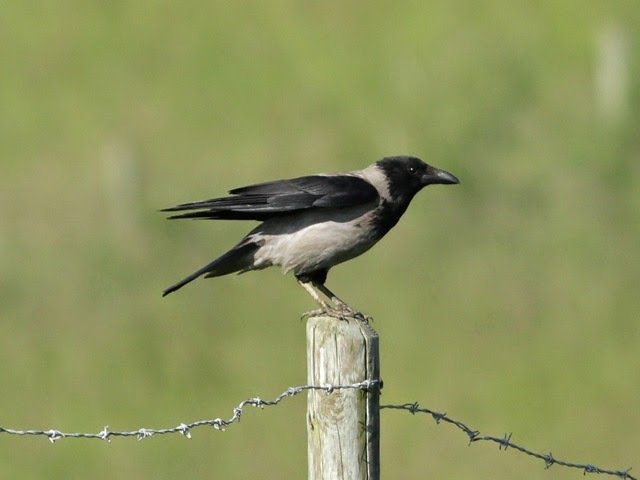 The Hooded Crow put in another appearance at the Bill during the morning when it was watched flying in off the sea (although it hasn't been reported for a couple of days it's most likely been around, but interest in it has dwindled and, as far as we know, its favourite haunt at the Grove pig farm hasn't been checked). Returning migrants included another 5 Sand Martins and another 4 Black-headed Gulls through at the Bill, whilst 18 Common Scoter and 5 Manx Shearwaters passed through on the sea there. A strong immigration of Red Admirals was evident at times today: early in the morning 44 flew north in 20 minutes along West Cliffs at the Bill, whilst in the late afternoon/early evening there was a steady northbound movement of singles every few minutes through the Ferrybridge/Chesil Beach area; a single individual was also caught overnight in one of the Obs garden moth-traps. 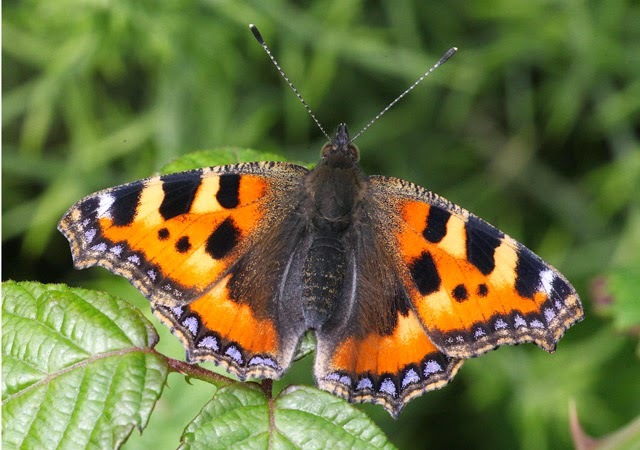 Five Small Tortoiseshells also passed through amongst the early morning movement along West Cliffs. 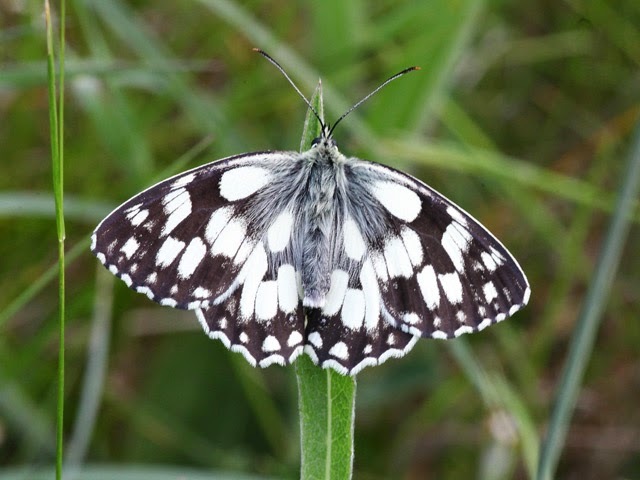 The tally of immigrants/wanderers in the Obs garden moth-traps included 22 Rusty-dot Pearl, 9 Silver Y and singles of Diamond-back Moth, Scallop Shell and Cream-bordered Green Pea, whilst a Marbled White-spot was the best of the non-residents at the Grove. A few photos from the day to follow tomorrow. It almost goes without saying that the prevailing anticyclonic conditions remained firmly established and it remained warm and sunny all day. The lack of change in the weather is no doubt the main factor in it also remaining quiet on the bird front, with precious little of note beyond the first 2 departing Sand Martins and yet another new Chiffchaff at the Bill and 9 Common Scoter and 3 Manx Shearwaters through on the sea there. No unexpectedly considering the current warmth, the moth-traps remained very busy indeed, with a slightly more varied catch of immigrants and wanderers evident at the Obs: 21 Rusty-dot Pearl, 2 each of Diamond-back Moth, Cream-bordered Green Pea and Silver Y and singles of Hummingbird Hawk-moth, Orange Footman, Dark Sword Grass, Obscure Wainscot and Delicate. 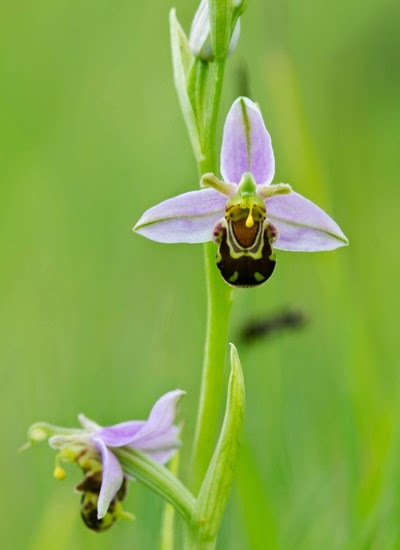 A reminder for Obs members that this year's AGM will take place on Saturday 12th July; the agenda for the meeting is available on the Notices page. There wasn't a cloud in the sky for a good part of what was another glorious day. 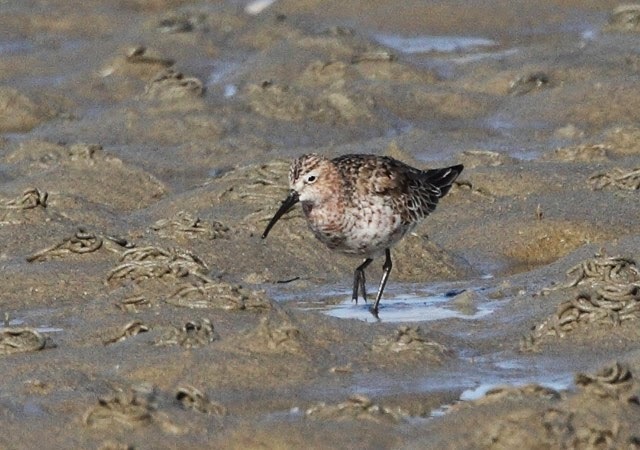 A Curlew Sandpiper at Ferrybridge stole the bird of the day honours, with 3 Sanderling and a Dunlin there and a Redshank at the Bill giving further indications of return wader passage beginning to get going. 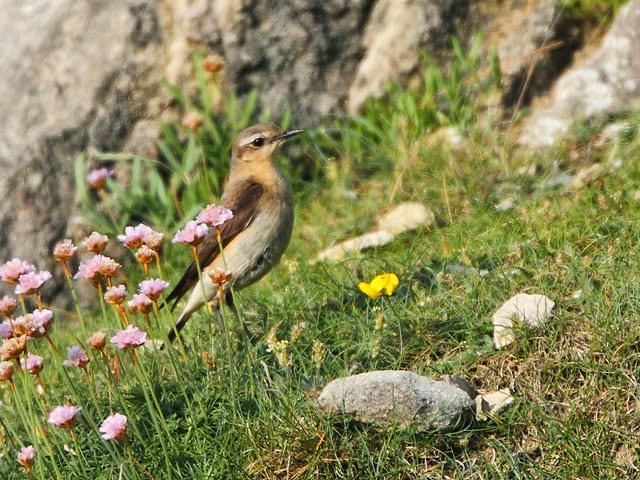 The Wheatear remained at the Bill, where at least 1 new Chiffchaff also showed up and 47 Manx Shearwaters, 40 Common Scoter and 2 Black-headed Gulls passed by on the sea. 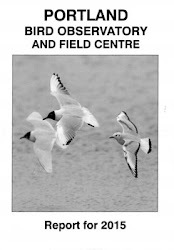 The only other reports were of 5 Mediterranean Gulls and 4 Shelduck at Ferrybridge. 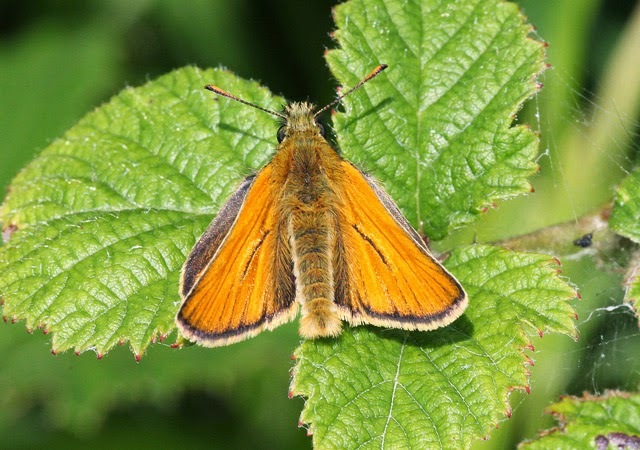 The immigrant moth list has been rather samey in recent days, with the overnight tally of 16 Rusty-dot Pearl, 2 Diamond-back Moth and a Delicate at the Obs indicating that little had changed on that front; a Scorched Wing was the best of the non-local wanderers caught there. We're not moaning in the least but at times it was stiflingly hot today, as well as beginning to get really muggy once some cloud rolled in late in the day. The 7 Storm Petrels tape-lured and ringed overnight at the Bill comprised 6 newcomers and, rather interestingly, a retrap first ringed three nights ago. Day-time interest was limited to 3 Chiffchaffs, a Grey Heron and a Wheatear at the Bill, 41 Manx Shearwaters and 7 Common Scoter through on the sea there, a Common Sandpiper at Chesil Cove and 6 Dunlin at Ferrybridge. 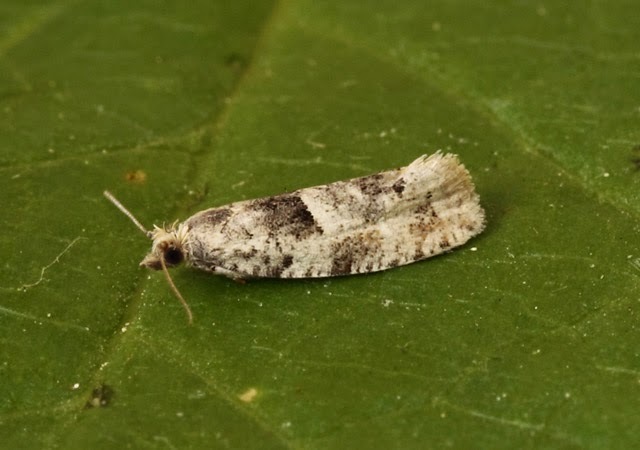 Immigrant/wandering moths included 26 Rusty-dot Pearl and singles of Diamond-back Moth, Pine Carpet, Green Silver-lines and Silver Y at the Obs and a Dotted Ermel Ethmia dodecea at Sweethill. Although the Hooded Crow remained in residence to provide the day's main interest there were a few new arrivals to pad out the list, with singles of Grey Heron, Lapwing, Wheatear and Chiffchaff all showing up at the Bill; a Black Redstart there was thought most likely to be the individual that's popped up from time to time in recent weeks in the Bill Quarry area. The only other reports worth a mention were of 20 Common Scoter and an Arctic Skua through off the Bill. 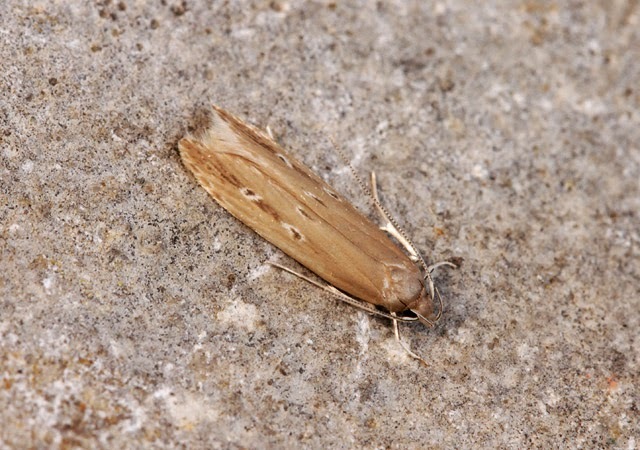 A Bordered Straw was the best of the overnight immigrant moths at the Obs, where the third island record of Striped Wainscot provided greater local interest; 22 Rusty-dot Pearl, 2 each of Cream-bordered Green Pea and Silver Y, and a single Diamond-back Moth made up the tally of routine fare. 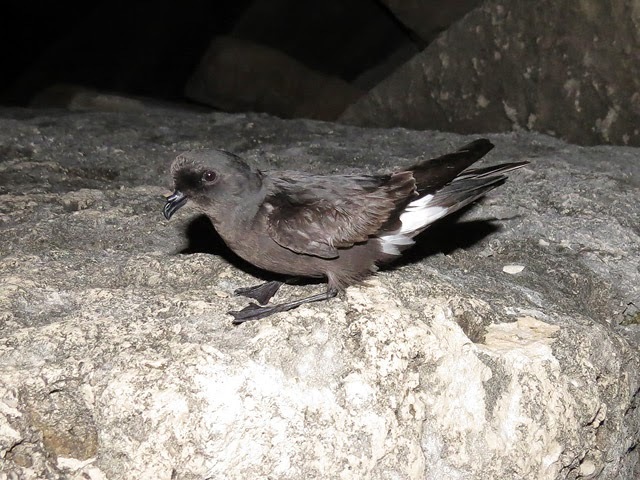 Another short petrel tape-luring session in less satisfactory conditions than last night came up with just a single Storm Petrel trapped and ringed overnight at the Bill. There was very little on offer during the hours of daylight: the Hooded Crow lingered on at the Grove, 2 Mediterranean Gulls were at Ferrybridge and 12 Common Scoter, 9 Manx Shearwaters and 6 Sandwich Terns passed through off the Bill. 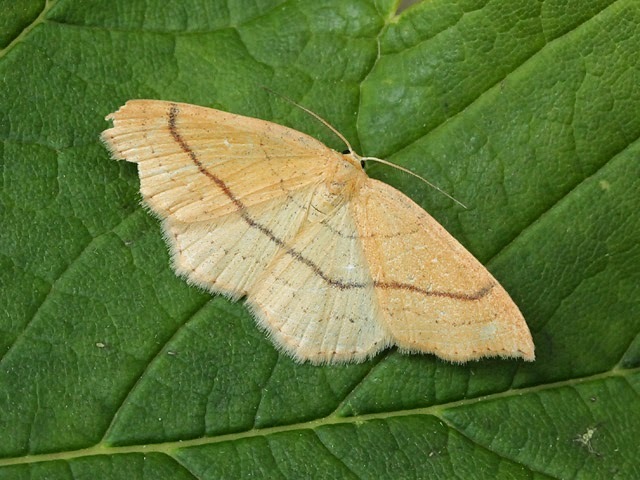 Singles of Marbled Yellow Pearl Evergestis extimalis and Obscure Wainscot provided the main interest amongst the immigrants/wanderers caught overnight in the Obs garden moth-traps; routine fare there included 27 Rusty-dot Pearl, 3 Diamond-back Moth and a Silver Y. 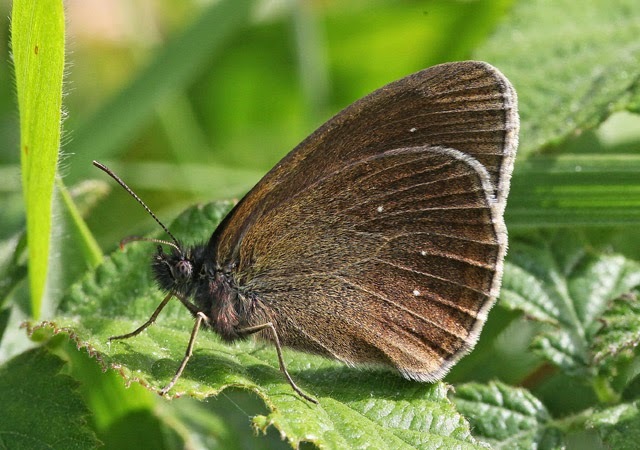 Elsewhere, singles of Hummingbird Hawk-moth and Delicate were of note at Sweethill. 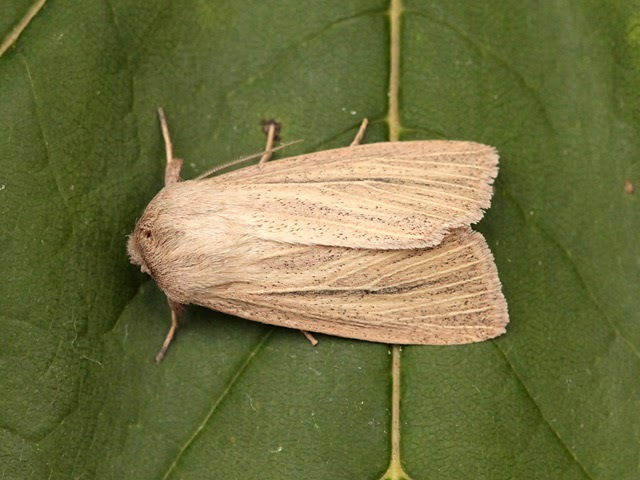 ...despite being a common inhabitant of the reedbeds at, for example, Radipole and Lodmoor, we think that last night's Obscure Wainscot is only the third recorded at Portland. 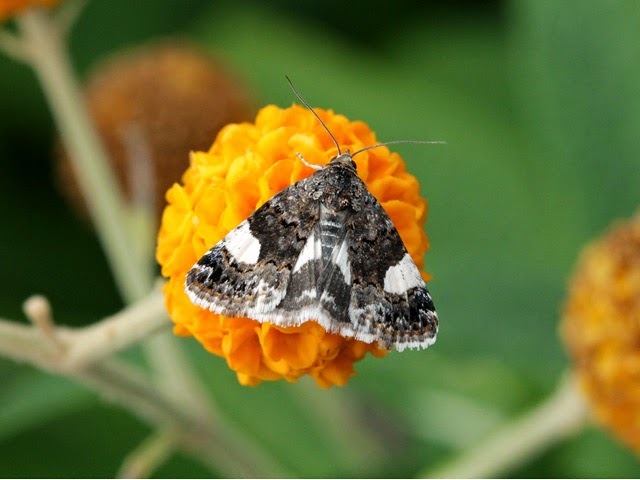 Four Spotted is a much rarer moth nationally but is relatively routine around the southern third of the island where it's one of the most sought-after of the Portland specials at this time of year. 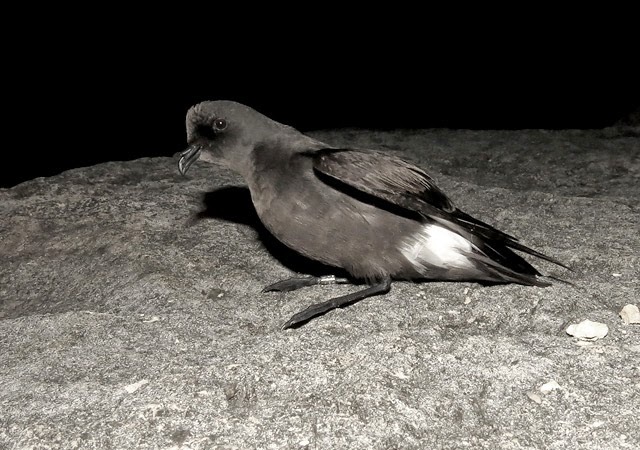 Overnight, 8 Storm Petrels were tape-lured and ringed (and several more seen but not caught) during a trapping session either side of midnight at the Bill tip. The daylight hours were rather less productive, although the slow beginnings of autumn passage was again signalled by the likes of 6 Mediterranean Gulls at Ferrybridge and 2 Curlew and 2 Black-headed Gulls through at the Bill. 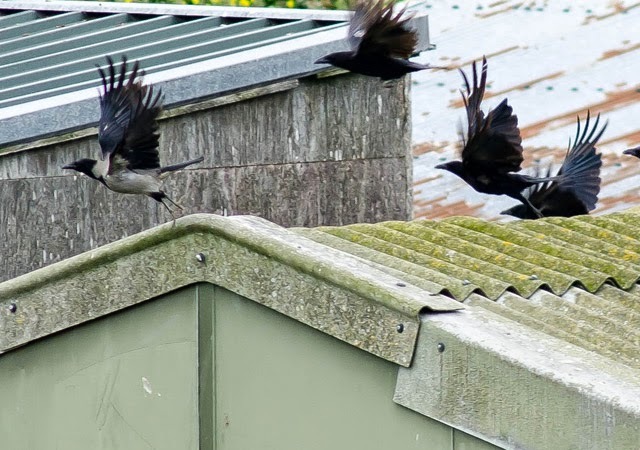 The Hooded Crow continued to roam around between the Bill and the Grove, 5 Chiffchaffs at the Bill included at least 2 new arrivals and singles of Redstart and Blackcap both remained in situ there. 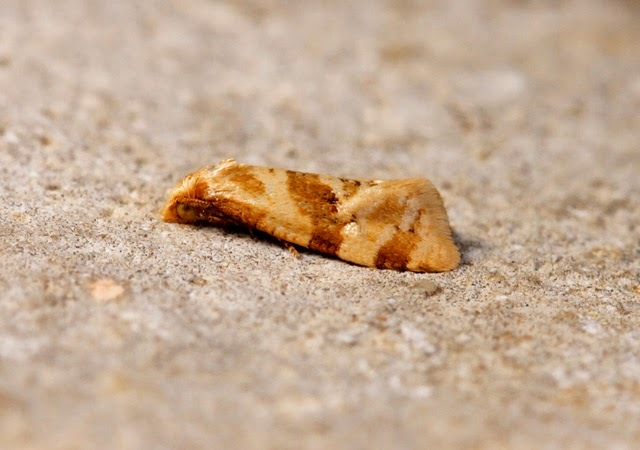 A Bordered White at the Grove was the pick of the overnight catch of non-resident moths; immigrants/wanderers at the Obs included 32 Rusty-dot Pearl, 15 Diamond-back Moth, 3 Silver Y and 2 Cream-bordered Green Pea. ...eight petrels would be a paltry return for a couple of hours effort at sites on the West Coast or in the Northern Isles, and it wouldn't have been much cop here 20 years ago in a bygone era when our record was something like 32 in a night; however for the last decade or so we've struggled to catch at rates of more than about one an hour, which does get rather disheartening when you're already suffering from acute sleep deprivation. With fewer being seen by day as well we'd begun to think that maybe they'd forsaken Portland waters for good but hopefully that'll prove not to be the case. With the Hooded Crow still about (mainly today at the Grove pig farm), a Marsh Harrier overhead at Weston late in the afternoon and a decent bit of movement on land and sea today was really pretty good for the time of year. A fair amount of cloud cover was likely instrumental in dropping a scatter of new arrivals at the Bill, where at least 4 Chiffchaffs and singles of Grey Heron, Redshank, Reed Warbler, Blackcap and Willow Warbler all made the tally; seawatching there produced 82 Common Scoter, 8 Gadwall, singles of Arctic Skua and Sandwich Tern and a trickle of Manx Shearwaters. The cloud cover kept the temperature well up overnight and ensured moth-trapping was very busy; immigrants/wanderers at the Obs included 39 Rusty-dot Pearl, 5 Diamond-back Moth, 4 Silver Y, 2 Cream-bordered Green Pea and singles of Lesser Wax Moth (the first record for the Obs, following the first four island records in the Southwell area last year) and Delicate, whilst another single Delicate made the list at the Grove. 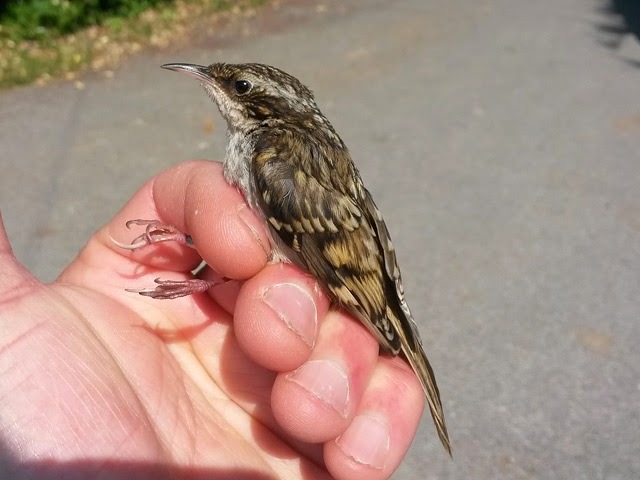 Mid-June came up with the goods again today when a Long-tailed Skua headed up-Channel past the Bill early in the morning; the Hooded Crow also showed up again and wandered widely between the Bill and the Grove pig farm, whilst a dispersing juvenile Treecreeper trapped at the Obs was an unexpected surprise. With more cloud in the sky conditions had perhaps looked favourable for dropping the odd tardy migrant; a passing Hobby on West Cliffs was of note, but aside from a couple of new Chiffchaffs at the Obs and a Grey Plover at Ferrybridge, precious little else materialised. 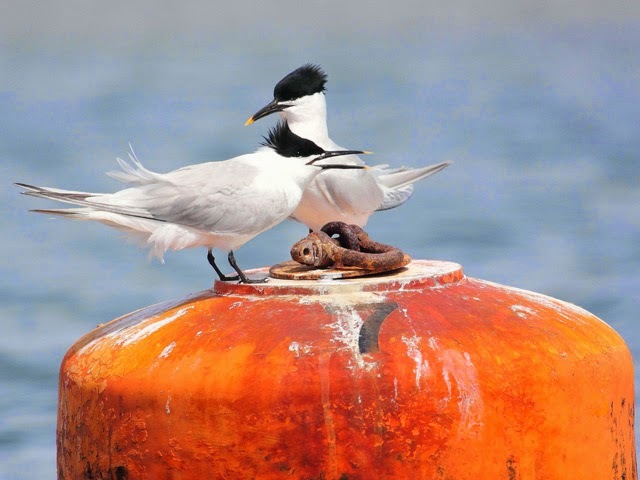 Additional to the skua, seawatching at the Bill came up with 18 Common Scoter, 3 unseasonable Eider, the first Mediterranean Gull for a while and a handful of Manx Shearwaters, commic terns and Sandwich Terns. 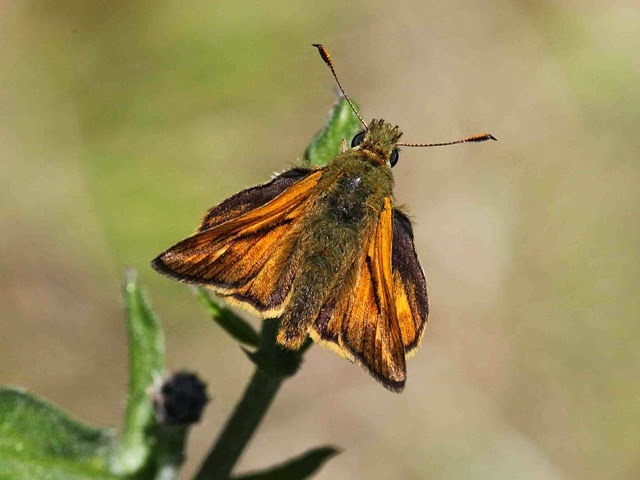 Migrant lepidoptera included a scatter of Hummingbird Hawk-moths everywhere, a Clouded Yellow at the Bill, and 18 Rusty-dot Pearl, 4 Silver Y, a Diamond-back Moth and a Brown China-mark caught overnight in the Obs garden moth-traps. 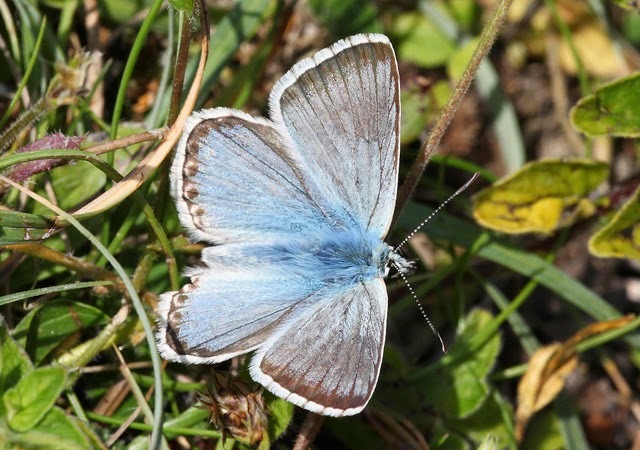 Friday the 13th might be unlucky for some but it was a good day for us, with two totally out of the blue oddities showing up when least expected on what was another day of heat and blazing sunshine. 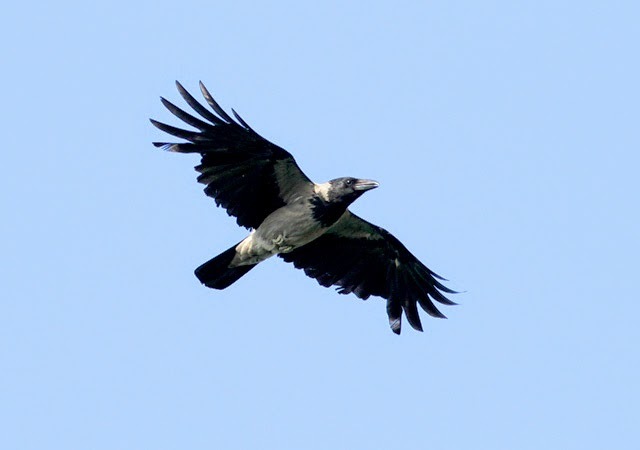 Hooded Crows are sufficiently rare visitors to Portland these days that a minor local twitch developed when one flew in from the north and lingered for a few hours at the Bill. Unfortunately it didn't remain long enough for the county lister who'd travelled furthest; however, his determined quest for his quarry led to the entirely serendipitous discovery, right in the heat of the middle of the day, of a nightingale in song in Top Fields. 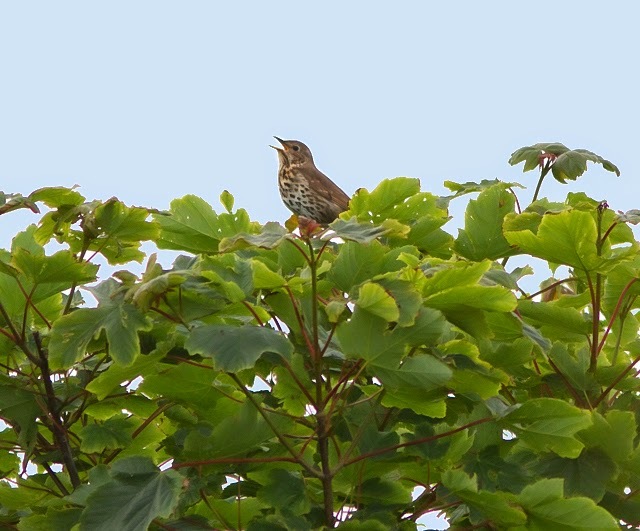 The date alone was enough to raise suspicions that it could be a Thrush Nightingale, but as it was resolutely invisible deep in cover these were only fully confirmed once recordings were made and checked out; the bird remained - still invisible bar a couple of the briefest of glimpses when it responded to visitor's sound lures - until dusk although its snatches of song became briefer and further between as the day went on. In comparison, the rest of the day's sightings were entirely inconsequential, but did include 3 Chiffchaffs, 2 Black-headed Gulls and a Grey Heron at the Bill, and 11 Common Scoter, 5 Sandwich Terns and a Whimbrel through on the sea there. Moth immigrants in the Obs garden traps included 27 Rusty-dot Pearl and singles of Diamond-back Moth, Clouded Buff (the third this year and only the sixth ever) and Silver Y. On what was easily the hottest day of the year to date the birding again took on a less than scorching quality. Two Chiffchaffs were the only new arrivals on the ground at the Bill, where 19 Common Scoter, 8 Manx Shearwaters, 2 Sandwich Terns and a Mallard passed by on the sea. Overnight mothing was no more productive, with 15 Rusty-dot Pearls and 2 Diamond-back Moths the only immigrants caught at the Obs. 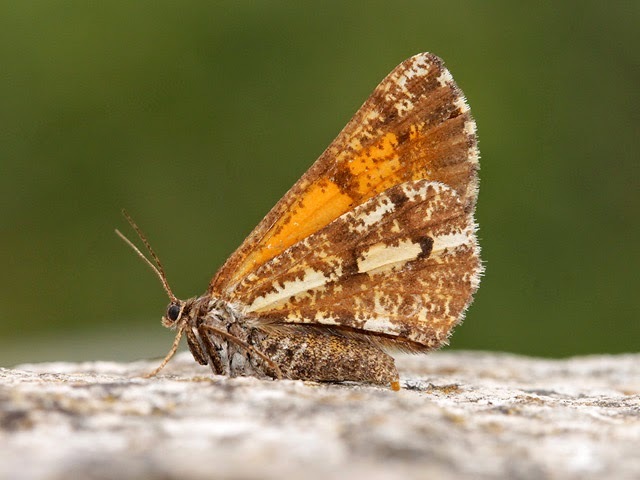 ...amongst the moths, mid-June marks the beginning of the flight period of several of the Portland specials - for example, both Portland Ribbon Wave and Four Spotted have been on the wing for the first time this year in recent days - and last evening we came across plenty of ocnerostomella around the only patch of Viper's Bugloss we could find at Broadcroft. 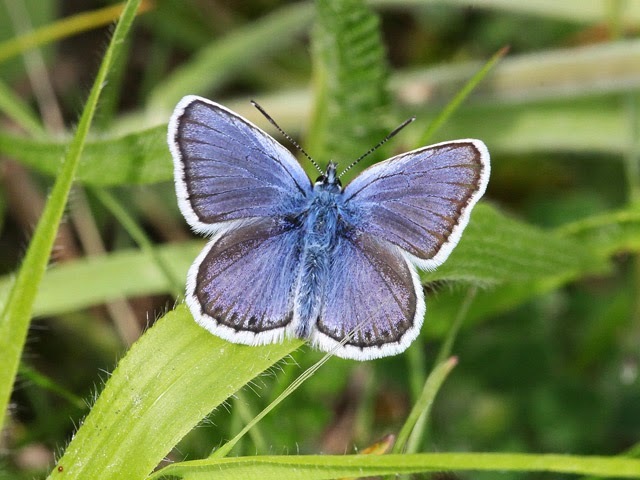 Although it's a pretty unobtrusive little species that you really need to get down on your hands and knees to see, we've pretty well never failed to find it whenever we've checked Viper's Bugloss anywhere on Portland; however, it seems from the Dorset distribution map that it's only been recorded from four tetrads elsewhere in the county. 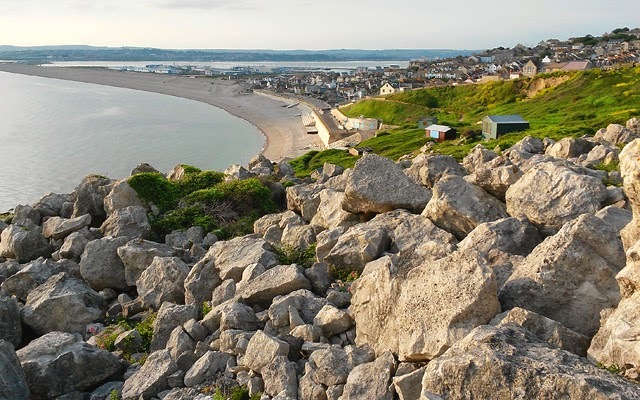 The continuing fine weather may yet spring a surprise but just at the moment it doesn't look particularly likely to drop much by way of quality arrivals. Today's only newcomers on the land were 3 Reed Warblers - 2 at the Bill and another at East Weare. The sea came up with 34 more Common Scoter and a Balearic Shearwater through off the Bill. 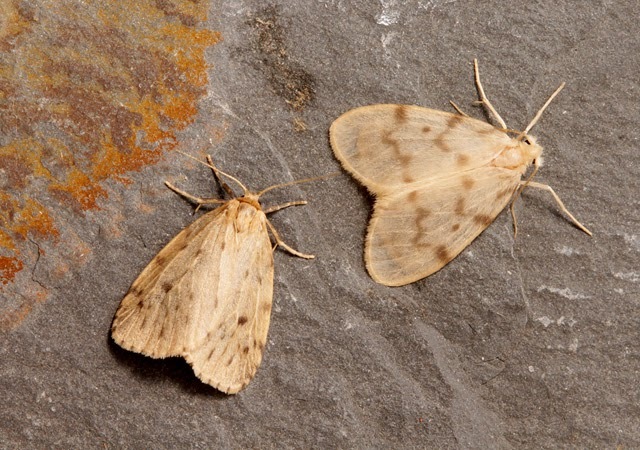 Moth immigrants included 27 Rusty-dot Pearl, 4 Diamond-back Moth and a Silver Y caught overnight at the Obs. 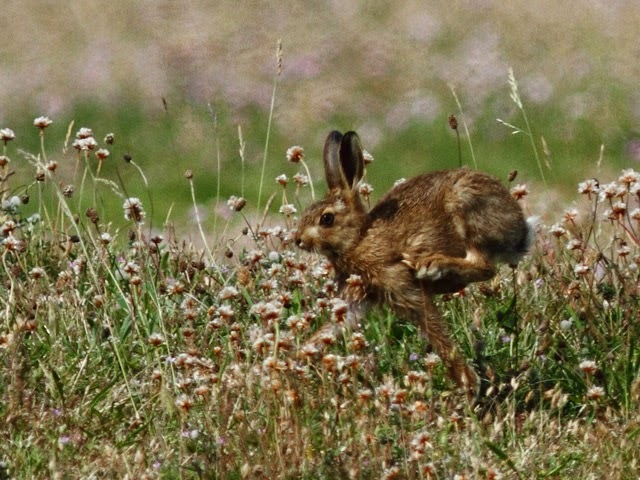 If you bear in mind that our record-breaking spring of 2012 somewhat slants the recent mean toward a higher value for most species than would have been the case if we'd totted up a longer run of comparison years, then 2014 really hasn't been too bad. Goldcrest is a stand-out loser - they seem very unpredictable these days, with annual totals far less related to the severity of the winter weather than was the case in the past - and Firecrest didn't do a lot better, whilst Whitethroat and Pied Flycatcher are the two obvious winners. It's fair to say that everything else managed pretty OK totals, which has to be heartening in this day and age. 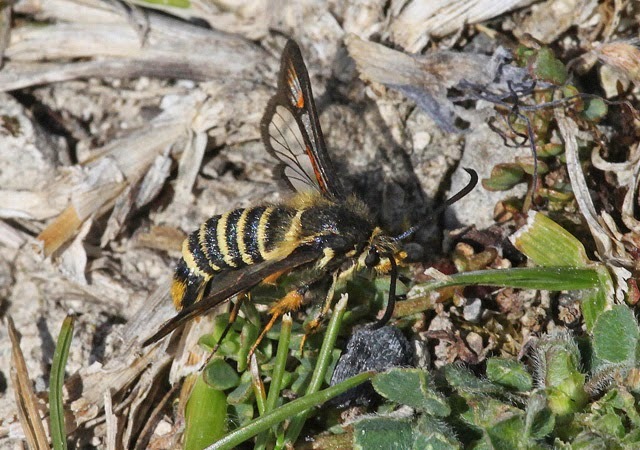 Just as a very pleasantly fair day was about to written off from the birding point of view so the latest fly-by oddity showed up; not altogether surprisingly it was another Bee-eater that was first heard over Top Fields and shortly afterwards headed south high over the Obs. The only other news worth a mention was of 2 Balearic Shearwaters through off the Bill. By day, there looked to be a new arrival of Painted Ladys everywhere, whilst Hummingbird Hawk-moths included 2 at Southwell and 1 at the Obs. 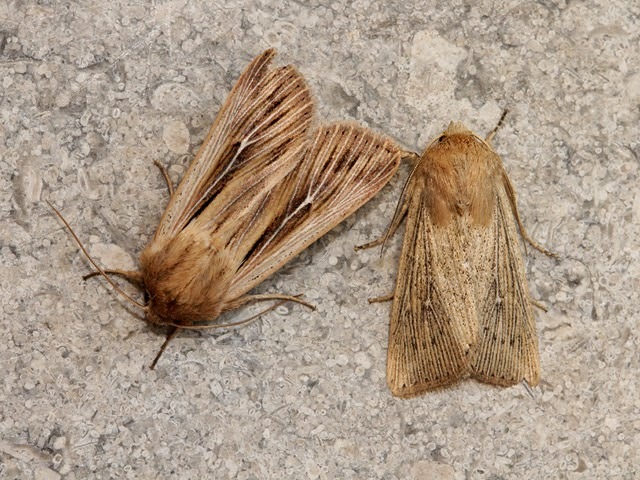 Two Delicates at the Grove and singles of Orange Footman at Southwell and the Obs were the pick of the overnight immigrant moth captures; commoner species at the Obs included 27 Rusty-dot Pearl, 8 Diamond-back Moth and a Pearly Underwing. Not for want of trying, the June rarities are proving hard to come by at the moment, with precious little of note on the land today bar a Willow Warbler at Blacknor. Some interest was salvaged from the sea, with 115 Manx Shearwaters, 29 Common Scoter, 11 commic terns, 5 Balearic Shearwaters, 2 Great Skuas and a Red-throated Diver through off the Bill. Moth immigration continued to tick over, with 22 Rusty-dot Pearl, 8 Diamond-back Moth and singles of Orange Footman, Clouded Buff, Pearly Underwing and Silver Y at the Obs; elsewhere, singles of Cream-bordered Green Pea and Orange Footman at Southwell and Dark Pine Knot-horn Dioryctria abietella at Weston were of note. With the warmth and sunshine only spoilt by a couple of passing showers during the evening, today saw a good deal of coverage, even if the rewards were pretty limited. The sea continued to come up with most of the variety, with 51 Common Scoter, 4 Great Skuas, 3 Sandwich Terns and a Balearic Shearwater passing the Bill and a few Manx Shearwaters milling around offshore all day. 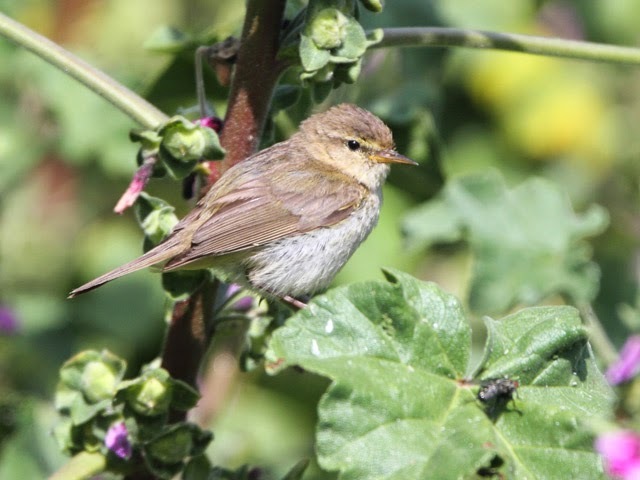 New arrivals on the land were limited to 2 Chiffchaffs and a Reed Warbler at the Bill and another Reed Warbler at Southwell. 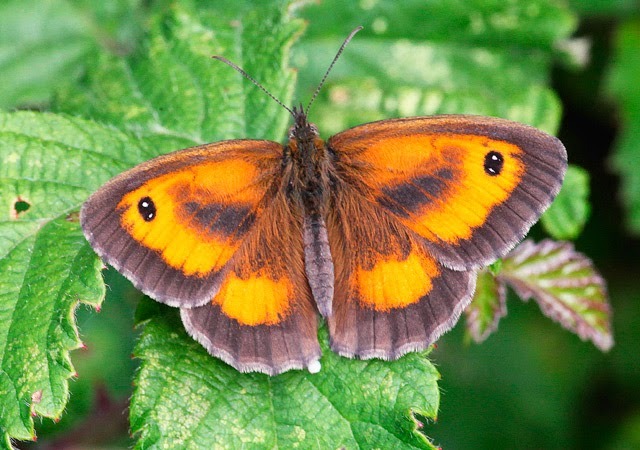 There was a conspicuous increase in Red Admiral numbers throughout the island, whilst only the second Clouded Yellow of the year was at the Bill. 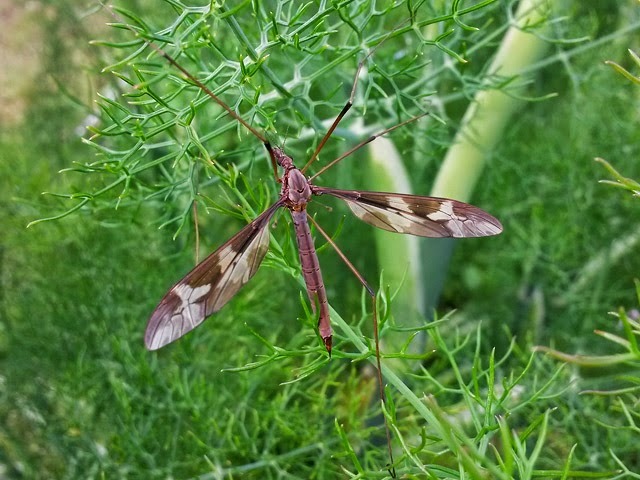 Moth immigrants included 7 Rusty-dot Pearls, 2 each of Diamond-back Moth and Silver Y, and singles of Hummingbird Hawk-moth and Delicate in the Obs garden moth-traps; 2 Tipula maxima craneflies were also caught in the traps. ...we know pretty well nothing about crane-flies except having gleaned that the strikingly-marked Tipula maxima is Britain's largest Daddy Long-legs; we're not even sure whether Tipula maxima is a permanent resident at Portland, although that perhaps seems unlikely as we're not sure we've ever encountered it 'at large' and its usual haunts are described as moist and often wooded locations. 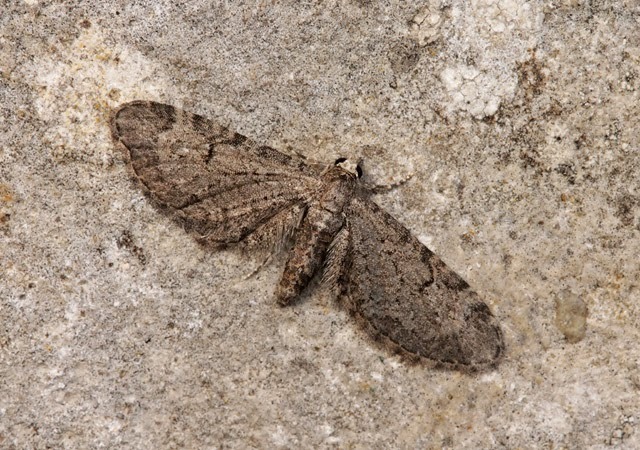 The only reason we've learnt anything about the species is that it turns up from time to time in the moth-traps and, maybe fancifully, we think of it a good indicator that there's interesting immigration in the offing - today's immigrant moth haul was hardly vintage, but perhaps it was just the vanguard of what's to come! Portland has been blessed or blighted, depending on your outlook on such matters, with a series of almost subliminal rarity occurrences this spring; one or two at least left a digital trace by which we might remember them, but others scarcely impinged on the consciousness, let alone the pixels. Sadly, today's Pallid Swift that streaked over one fortunate observer at the Bill during the afternoon fell into the latter category, and was gone as quickly as it had been spotted. After a night of passing electric storms and occasional downpours it was no surprise that a handful of late migrants made landfall, with 2 each of Chiffchaff, Willow Warbler and Spotted Flycatcher at the Bill and another Spotted Flycatcher at Southwell all new in; 2 each of Mallard and Black-headed Gull, and singles of Whimbrel and Sanderling also showed up at Ferrybridge. The sea has been well worth attention in recent days, and today chipped in with 72 Common Scoter, 12 Balearic Shearwaters, 3 Great Skuas, 2 Arctic Skuas, 2 Sandwich Terns and singles of Curlew and Pomarine Skua through off the Bill. Despite promising-looking conditions, moth immigration remained very subdued, with 13 Diamond-back Moths and singles of Rush Veneer, Cream-bordered Green Pea and Silver Y the only migrants/wanderers caught overnight at the Obs. With a freshening easterly a feature all day the sea got most of the attention and came up with another strong movement of scoter: 235 Commons and a very late Velvet passed through off the Bill during the morning; at least 4 Balearic Shearwaters lingered offshore, whilst 4 Manx Shearwaters, 4 Sandwich Terns and 2 Arctic Skuas also passed by. The only reports from the land were of a lone Wheatear at the Bill and 4 Sanderling and 2 Whimbrel amongst the waders at Ferrybridge. 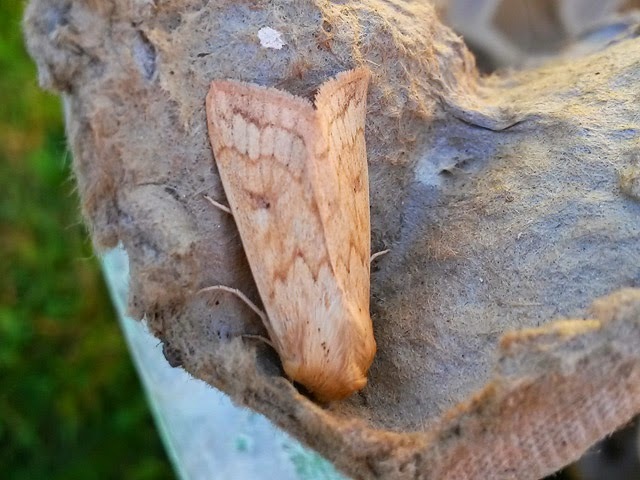 A Clay Triple-lines was found overnight on the outside of a lit window at the Obs, but a single Silver Y was the only immigrant caught in the Obs garden moth-traps. ...being a Beech feeder, Clay Triple-lines is never a frequent wanderer to Portland. On a lovely day to be out birding the chief rewards came from the sea, with 15 Common Scoter, 8 Balearic Shearwaters, 2 Great Skuas, singles of Great Northern Diver and Arctic Skua, and a light trickle of Manx Shearwaters through off the Bill. 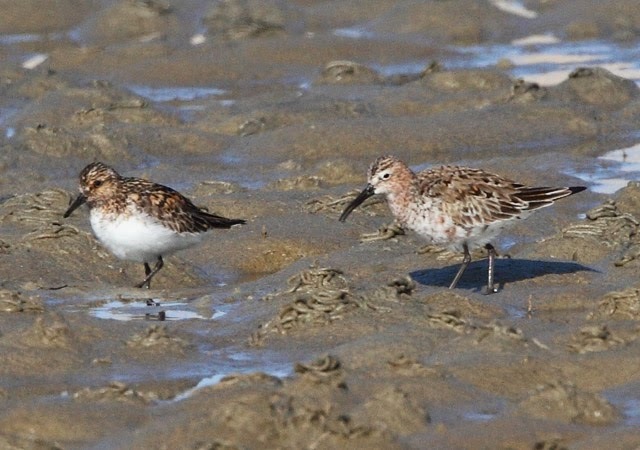 The land came up with few surprises: the wader haul at Ferrybridge included 24 Dunlin, 8 Sanderling and a Whimbrel, whilst 4 rather tardy Wheatears were at the Bill. 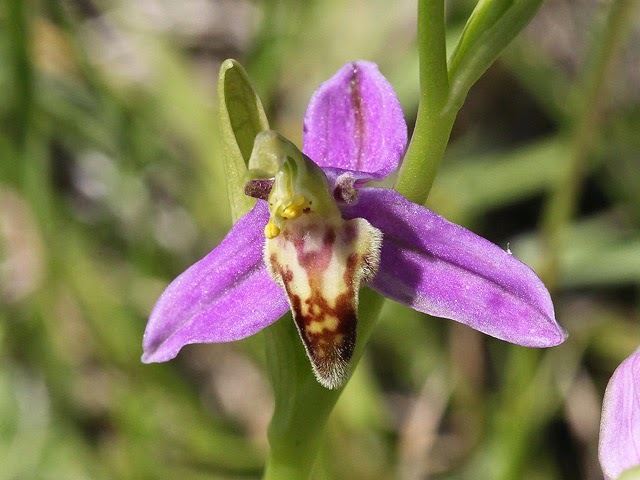 ...amongst the Bee Orchids there are several resembling or getting close to var. 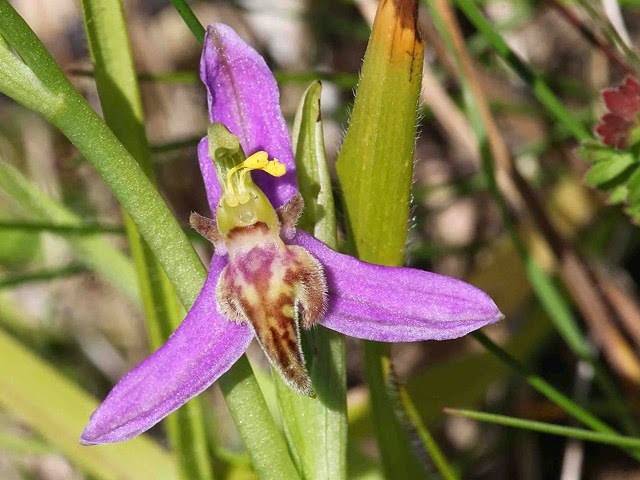 trollii, the so called Wasp Orchid.